Recently my wife read a book by Nicholas Sparks, The Wedding (this is an affiliate link). She really enjoyed it and thought it would be something that I would like to read as well. After considerable encouragement I decided to read it. At the very least we would have that in common and something to talk about. I've actually really enjoyed the book. One of the things that I found most enjoyable about reading it was the reminiscing. The main character spends a lot of time remembering early events in his relationship with his wife. Events like when they first met, their first date, first kiss, the early days after they were married, when their children were young, when he proposed, etc. What was really fun for me about all of this is that I started reminiscing too. Then, next thing you know, Cami and I are doing it together. 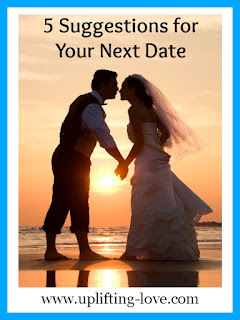 Did your first date go as planned? If your experience was like the one I had with Cami then it didn't. Think back on how it was supposed to be versus how it ended up. It will put a smile on your face. When and where did you meet? Why did he ask you out (or vice-versa)? Why did you say yes? What one thing have the two of you never told anyone about? Now, I have just one question for you: when was the last time you reminisced with your spouse? What a great blog! Newest follower here... I was hoping that you'd pop on by and follow me back. Love this post! As a newlywed, my husband and I reminisce often. It's amazing to see how we've grown in a year. A lot of naysayers say that as each year goes by, we won't do this anymore. I am out to prove them wrong. Good for you Tiffany. My wife and I regularly reminisce and we love it. If anything we seem to do it more often the longer we are married. That book sounds interesting. I've never read one of Nicholas Spark's novels but I do enjoy his movies. Your question on reminiscing is interesting because I think we both do it more often than we realize. Maybe because we have so many pictures chronicling our lives together on our desks, walls, Facebook page, etc. that we're constantly reminded of this but we love to think about where we began and every step along this journey together. That's a good point Fawn. I think having lots of little reminders about our spouse and family help with that too. We have lots of pictures in our home, I have pictures and notes in my office at work, and even the background on my phone is usually of my wife or children. These reminders do help us reminisce regularly and keep the feelings of love alive. These are great ideas! Remembering where we have been together and looking at the highlights seems to enliven the expectation for more of the same. You describe some great ways to, like the song says, bring back that loving feeling. I hadn't even thought about that song but that's great!